Sorry, UD All in One Coil Jig has been discontinued. 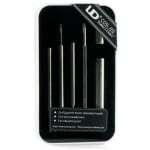 The UD All In One Coil Jig by Youde is the perfect set of portable tools for building your own coils. The UD Coil Jig is a portable accessory made of 304 stainless steel and includes multiple screw driver heads to cater to a variety of coil builds, with 4 different bit sizes (2.0mm, 2.5mm, 3.0mm, 3.5mm) allowing you to build your coils to many diameters.